Washoku is Japanese cuisine, characterized by its use of fresh seasonal ingredients, balanced nutrition and seasonal aesthetic presentation. Our menu includes appetizers such as Gyoza (potstickers) Shumai (dumplings), Kara-Age (Japanese Fried Chicken), Kushi (Fried or Grilled Skewers), Seafood Canapes and more small dishes. 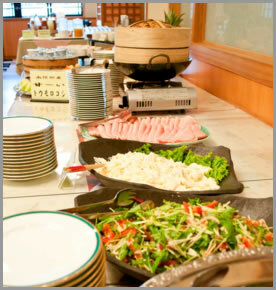 Perfect for receptions and networking gatherings at corporate events! Japanese Style Boxed Lunch which holds rice, fish or meat, with pickled or cooked vegetables, usually in a box-shaped container. 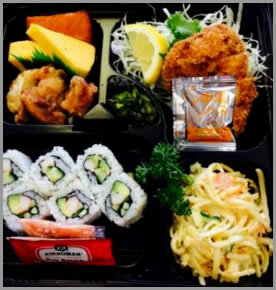 Our popular Chef’s Choice Box includes Sushi Maki (or Plain Rice), Chicken Teriyaki or Grilled Salmon, Chicken Kara-Age (Fried Chicken), Croquette, Shumai, along with side items such as Tamago/Sweet Egg, Salad, Pickles, Edamame, etc. Perfect for pre/post-meeting gatherings!